This report explores the commercial potential of C-RAN (Cloud or Centralized Radio Access Network), the principal emerging architecture for distributed radio access networks (RANs) used in mobile phone networks. CIR believes that C-RANs will become essential for 5G mobile networks where they will contribute to both cost reduction and performance improvement. Not only is the conventional RAN approach expensive in terms of both Opex and Capex, there is also a problem with interference between the base stations. Mobile service providers in Asia are already reporting 30 to 50 percent Opex reductions. C-RAN deployments will also make a contribution to the essential need for power efficiency in 5G Networks. In the report CIR discusses how major suppliers of equipment for mobile infrastructure will position themselves for the 5G market using the technology as part of their strategy. It also examines what functionality the mobile service providers are looking for from future distributed RANs. Finally, the report examines the size and structure of the market that the arrival of C-RAN will have for the fiber optics, radio communications, and server businesses. As far as the IT aspects are concerned, we include a discussion of how C-RAN is repurposing conventional data center concepts to create a low cost, high reliability, low latency and high bandwidth interconnect network within the BBU pool. 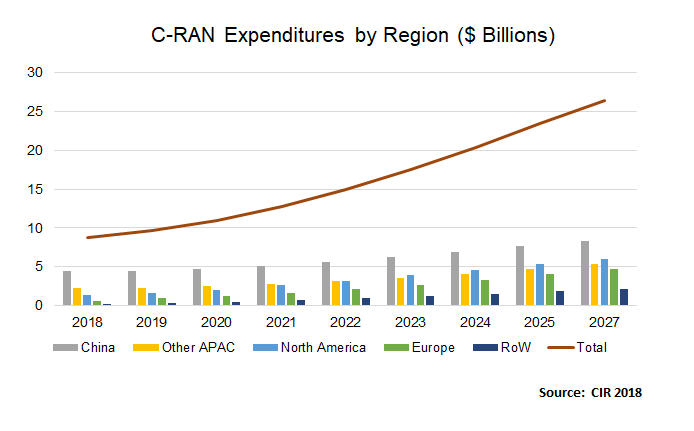 Although CIR believes that C-RAN presents a significant market opportunity going forward, we also explore the factors that are holding it back and how these are likely to change in the future. One of these factors is fronthaul, which is being completely redesigned for the 5G era. This report shows how the recent great leap forward in fronthaul technology will positively impact the deployment of C-RAN architectures as latency and synchronization requirements increase. We also discuss the issues surrounding virtualization in the C-RAN architecture and what that will mean for opportunities for specialized processors and accelerators. Also included in this report are ten-year market forecasts for revenues and deployments and a thorough discussion of product trends – such as the move to smaller C-RANs – as represented by the announcements from leading vendors. Although, distributed RAN architectures have been around since 3G mobile, the focus of building mobile architecture was on providing broadband connectivity and distributed RANs were not a priority. With 5G, priorities have changed and C-RAN deployment has become critical. This report is designed to guide business development executives, product managers, investors and others to where the C-RAN opportunities can be found. 1.1.3 What Could Possibly go Wrong? Call our offices during normal business hours (use contact phone) and place your order over the telephone.